Velocity of an object is a physical quantity, which is defined as the rate of change in the displacement of the given object. Velocity is a vector quantity, therefore it has both magnitude and direction. This is due to velocity of the object being dependent on the displacement which is also a vector quantity. Therefore, velocity of an object measures the rate of change in the position of the object. This implies, if an object travels in a path and reaches the initial point, then the velocity of the object is equal to zero. This is because there is no change in the position of the object. Distance is the total path travelled by the object in the given time interval. Distance is a scalar quantity so it has only magnitude and no direction. 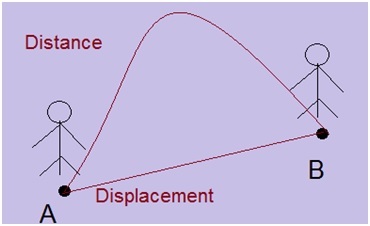 Displacement is the shortest distance between the initial point and the final point of the object. Displacement is a vector quantity, hence it has both magnitude and direction. For example in the diagram shown above the person is travelling from point A to point B. Later he travels back from point B to point A. Now the person in back at the initial position. This way the net displacement of the person equals zero. This implies, the velocity of the person equals zero. 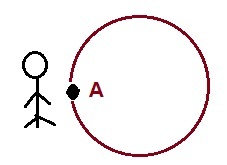 In the diagram shown above, a person travels from point A to point B. The curved path shows total distance travelled by the person, whereas the straight line signifies the displacement of the person from point A to point B. This displacement is used to calculate the velocity of the person. The other commonly used units for velocity are miles/hour (MPH), KMPH, ft. /s. The velocity of an object can be analyzed using the displacement time graphs. The following are some examples of how the velocity is dependent on the displacement time graph. 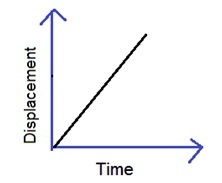 In the diagram shown above the displacement of the object is constant with the change in the time. This implies that there is no change in the displacement with respect to time. Hence the velocity of the object is zero. 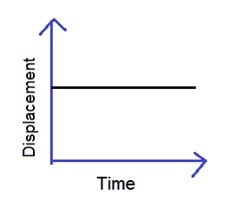 The displacement time graph shown in the diagram above is a straight line. Here the line has a fixed slope which implies the object is travelling with a constant velocity. In the diagrams shown above the displacement time graph of an object is a curved line. This implies that the velocity of the object is non-uniform. In the first graph the velocity of the object is increasing. In the second diagram the velocity of the object is decreasing. Question: A vehicle travelled 40 Km North, what is its displacement? Solution: The displacement will be 40 KM North. This is due to the vehicle travelling North is the shortest distance travelled by the vehicle between its end points. Question: a) A car moves 40 Km North and 60 KM to the south what is the displacement? b) Find the velocity of the car if the time taken is 2 hours? Solution: a) The net displacement of the car is 20 KM South. This is due to displacement is the shortest distance between the start and the end point. So the magnitude of the displacement will be equal to 60 KM – 40 KM = 20 KM. The direction will be 20 KM, South. b) Here displacement of the car = 20 KM, Time taken for the travel = 2 Hr. Using the formula for velocity. Therefore, the velocity of the car = 20 KM/ 2Hr = 10 KMPH. Question: a) A car is travelling 40 KM North and 30 KM East. Find the net displacement? b) What is the velocity of the car if the net time taken in 4 hours? Solution: Here since the car is travelling, North and then East, for the net displacement the shortest distance needs to be calculated. For the displacement the shortest distance between the start and the end point needs to be found. So the displacement is the magnitude of the hypotenuse = √(402 + 302) = √1600 + 900 = √2500 = 50 KM. Therefore the net displacement will be equal to 50 KM. b) The net displacement of the car = 50 KM. The time taken by the car = 4 hours. Questions: A man is walking 5 miles in one direction for 2 hours and continues to walk another 4 miles in the same direction for 1 hour. Find the average velocity by which the man covered the distance? Answer: The total displacement travelled by the man = 5 miles + 4 miles = 9 miles. The total time taken for the man to walk = (2 + 1) hour = 3 hour. Therefore, the Average velocity of the man = 9 miles/ 3 hours = 3 miles/hour. Questions: A man is walking 5 miles in one direction for 2 hours and continues to walk another 2 miles in the opposite direction for 1 hour. Find the average velocity by which the man covered the distance? Answer: The total displacement travelled by the man = 5 miles - 2 miles = 3 miles. 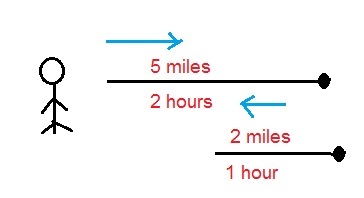 Therefore, the Average velocity of the man = 3 miles/ 3 hours = 1 miles/hour. Question: A man travels in a circular path and land where he started. Find the average velocity with which the man travelled if he takes 30 minutes to cover the circular path. Solution: In this question the path is a circular path. The person lands where he started so the net displacement of the man is equal to zero. Hence the velocity of the man is also equal to zero.